The unprecedented rate at which organizations have adopted cloud computing has fundamentally transformed business and government computing infrastructure. IT market researcher IDC predicts that IT cloud services revenue will reach $43.2 billion in the United States by 2016—up from an estimated $18.5 billion in 2011. Although cloud computing undoubtedly affords organizations with remarkable cost savings and operational efficiencies, it also brings new risks and uncertainties. 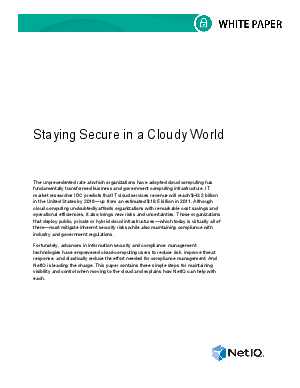 Those organizations that deploy public, private or hybrid cloud infrastructures—which today is virtually all of them—must mitigate inherent security risks while also maintaining compliance with industry and government regulations. Fortunately, advances in information security and compliance management technologies have empowered cloud-computing users to reduce risk, improve threat response and drastically reduce the effort needed for compliance management. And NetIQ is leading the charge. This paper contains three simple steps for maintaining visibility and control when moving to the cloud and explains how NetIQ can help with each.